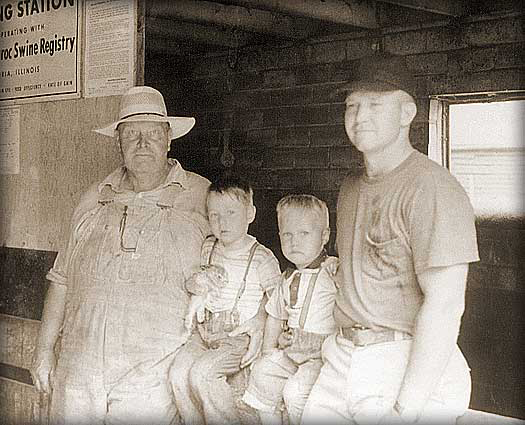 Compart Family Farms™ is made up of fourth generation swine producers. What initially started as a 4-H project, has now grown to one of the largest family-owned swine genetics businesses in the Midwest. Originating at Nicollet, Minnesota, Compart Family Farms™ has grown to having multiple locations in Minnesota as well as a central Iowa location. The family philosophy has always been doing what is right for the long term and never cutting corners. On-the-farm performance testing of hogs was Compart Family Farms™ trademark. Implementing extra testing procedures for growth rate, back fat and carcass data has always been used and will continue to help make genetic progress for years to come. As a result of this genetic improvement, breeding stock with the Compart Duroc™ name was in high demand. As many as seven production sales per year were held at the Nicollet family farm as a method of merchandising Compart Duroc™ genetics. In a typical sale, boars and gilts were sold to customers throughout the Midwest. In the early 1990’s, Compart Family Farms™ saw a need to add new genetic lines. Duroc, York and Landrace animals were imported from Sweden and Denmark. Many of the imported sires quickly surfaced to the top of their respective breeds. The consumer began asking for leaner pork and suddenly there was an emphasis on eating qualities by the pork producers. Compart Family Farms™ responded to this challenge by participating in many genetic evaluations that compared their products to that of other genetic companies. With favorable results from several comparisons under their belts, the Compart family decided to take their story to the consumer. The Compart Duroc™ premium pork label is the result of the family commitment and superior product produced on the Compart Family Farms™. Premium quality Compart Duroc™ pork is the result of a carefully managed pork breeding program. Compart Duroc™ hogs are bred, born and raised on small farms where family members are involved in the day-to-day management of their stock. The breeding program is the result of 55+ years of combining the very best purebred lines of the Duroc breed. Compart Family Farms™ has also conducted extensive research and development to create a proprietary Compart Duroc™ feeding program. This feeding program optimized both the pig’s performance and its meat quality. This, coupled with raising the pigs in comfortable, environmentally stable facilities, reduced stresses that adversely affect muscle quality.